After Border Barricade, Gully Ravine rapidly becomes a shallow depression, and eventually divides in two. To the north west, the continuing section was called the Nullah, and after the end of June and the capture of a series of trenches on the Gully Spur and seaward side, the Nullah was bitterly fought over. The furthest point ever reached by the allies on the cliffs was called ‘Fusiliers Bluff’ and it was a focus for mining and bombing actions right up to the evacuations. 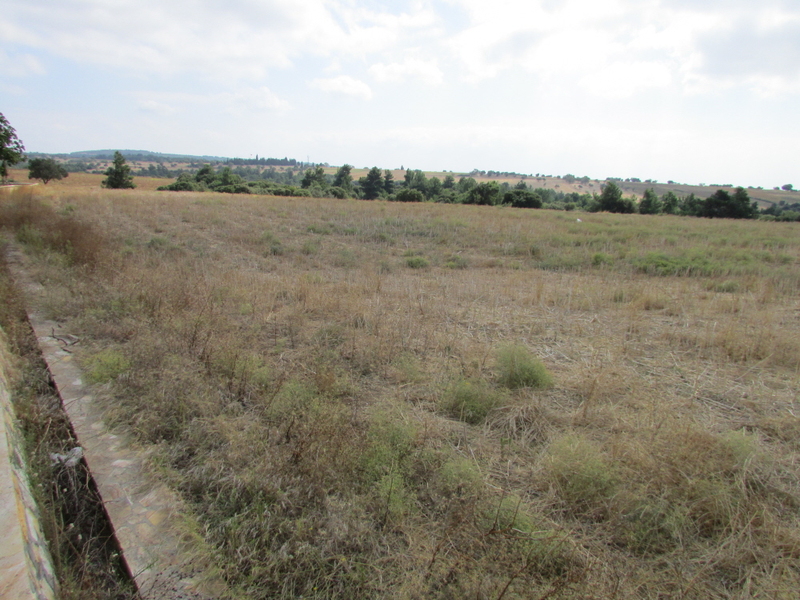 The area saw the detonation of a number of large mines, and the shallow crater of one can still be seen when the fields are bare a few tens of metres to the east of the existing memorial, see photo below. It was in this vicinity that Alfred Smith won his VC, posthumously. 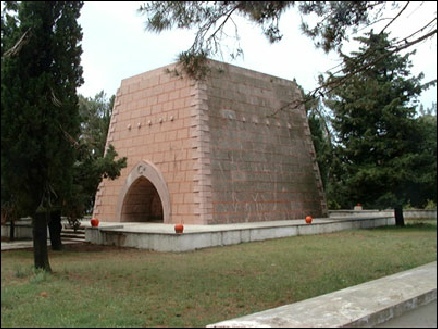 The Turkish memorial in this area is known as Nuri Yamut Aniti, after the Turkish officer who led the defence here and who also sold his house to fund the building of the memorial. It is a quiet walled area overlooking the sea. 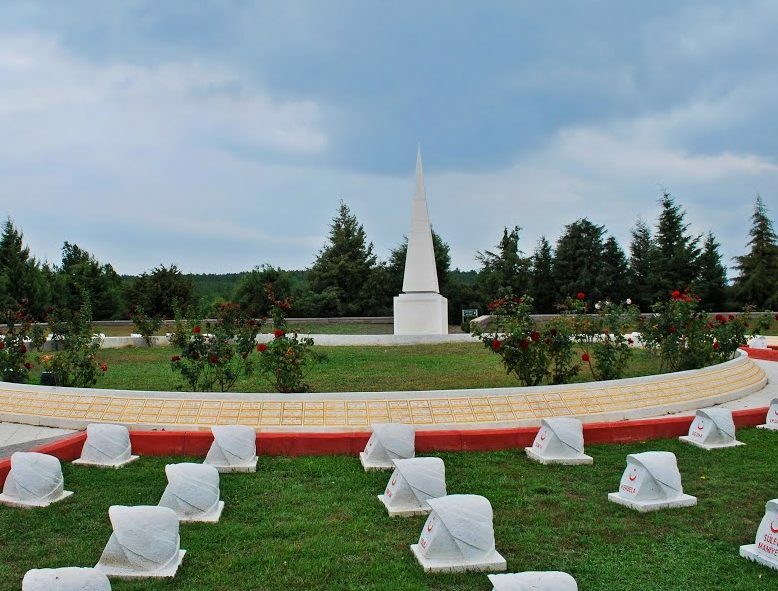 In 2009 the Turkish authorities built a further memorial about 400 metres to the south west to commemorate the courageous and hugely costly Turkish defence of the head of Gully Ravine. It is designed around a crescent shape and visually it appears to have been built with Google Earth views in mind. It is located directly over Essex Street and other allied trenches. Photo, right, above. In the field to the south of the Nuri Yamut monument there is the shallow remnant of a large mine crater which was detonated here by the Turkish in the last weeks of the campaign. The image above shows the crater in the centre ground. This photo looks south eastwards back towards the upper section of Gully Ravine. The low rise on the horizon on the top left is Achi Baba. From here, it is possible either to follow the road back to Alcitepe, crossing the head of Gully Ravine at the Turkish Dressing Station memorial, or to walk south eastwards back into the gully and out the other side, in the vicinity of the junction with the Nullah. It is then possible to follow the farm tracks east into the village, over the lines of the old H trenches 14 and 15.